I appreciate the opportunity to participate with you in a very unique learning experience. I wanted a chance to stretch my own thinking and I simultaneously wanted a chance to explore a set of projects. In my mind these projects that were pretty much about as far as I could go on this edge that Allan Kaprow had set me out on in 1972. That is – When is it art and when is it life? Where do you go to the edge of that boundary? When does your work become a social process that is not art? Now, I don’t mean to say that art can’t be a social process because, obviously, it can. I have seen lots of artists over the years who get so engaged with a particular kind of issue that, before you know it, they’ve transformed it into some form of organisation or bureaucracy or they’ve become a member of the bureaucracy. In fact, in Oakland, I could have easily run for office. I was invited to continue working on police training and I certainly could have had a job in education running the art programme for the Alameda County Office of Education. Instead, I decided to stop and reflect for the next period of time on what it was, precisely, that the Oakland projects were. Indeed, because this work is dialogic – when Anne and I got together, we began to think about ways to learn that were also dialogic. She constructed a learning plan that would bring people like Tom and Grant, who are people who have a lot to offer to my thinking, together with all of you. Many of you are practitioners in the field and have a lot of questions. When I was going over the transcript of the last session, I found that some of the most critical questions came from the core participants. Basically, what I am humbled by, and excited by simultaneously, is this very unique learning opportunity for me to write, coming out of the dialogic process where my own thinking is stretched – certainly beyond what it has been for the past several years. Tonight is Tom’s forum. I’m only here to set the context for those of you who might not know of the Oakland projects (1990-2000). We will discuss one example tomorrow. These were created, curated and produced by involving a set of maybe a hundred, two hundred people, over the course of ten years through nine performances or installations, and a lot of manifestations in every other capacity from City Council events to youth development programmes. Over the course of these ten years, this work became so engaged and situated within this particular community of three hundred and fifty thousand people that is Oakland, that it began to be hard to separate what was the art and what was getting up in the morning and going and having coffee with some of the people that you had worked on a performance with the night before. Most of these projects are documented and some of them are documented actually by youth. There are probably 10 to 15 youth-presented, youth created documentaries and then there are documentaries on the major projects. The work grew out of an analysis of the way in which young people are represented and the political uses of that representation in the public sphere in California. It deeply engaged with intersecting issues such as criminal justice, health, education and public policy issues. Throughout the projects we worked with well over a thousand young people. We were honour-bound to deliver training, education and one-on-one mentorship programmes under the guise of youth development. For me, it was also an enquiry in its own right into issues of Power and Representation and the limits of art. 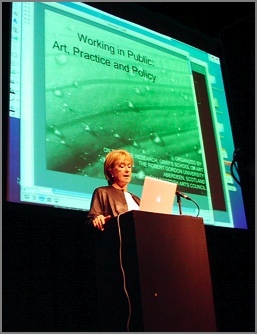 Concerning power, Francis mentioned the relationship of power between the artist and the community. You all have also brought forward the relationship between the funder and the artist, whether it is the government or the philanthropist. That is very fundamental.There is also the relationship of the artist and the art professional to the market. I know many artists are frustrated with the inability to penetrate the professional museum and gallery art world. Finally, these pieces are about the conflict of power between youth and adult authority in its various manifestations. Representation is at the heart of these projects. How are youth represented, and how do they participate in their own representation? How is the work represented in the community, and their understanding of it as art? How is this art represented in the art-world? Tomorrow we will start moving in to how is it represented politically in the public sphere to politicians. Now I would like to introduce Tom Trevor. We have prefaced this conversation tonight and tomorrow with a very interesting conversation where it was apparent that our personal journeys through art curation and so on, were something that we identified with each other and maybe would form a basis for a conversation between us. In 1986 Tom graduated from Goldsmiths and was an artist working in London for eight years in public-sited work and then, through that kind of manoeuvring which I think happens more often than one necessarily talks about, an artist begins curating. He curates his friends and what they are interested in. He curates the kind of projects that continue to represent his own interest as an artist. Tom curated a series of projects for the Institute of International Visual Arts, Camden Arts Centre, the Freud Museum and at the Wellcome Trust. That is when it goes from art-making into no longer art-making – perhaps. He became the curator at Spacex for six years creating a series of innovative projects we will hear about. He is now, as we’ve mentioned, in the belly of the beast as the Director of Arnolfini.